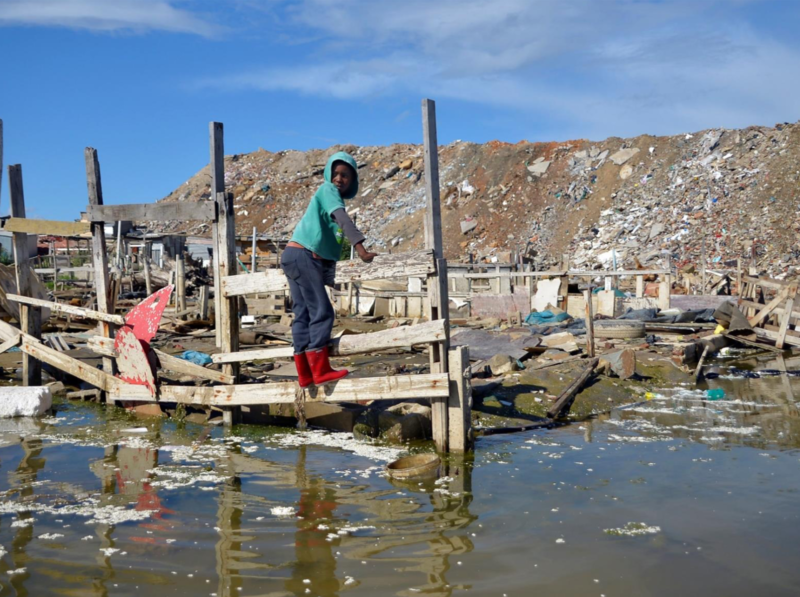 Cover Photo: Armand Hough, 2014, A child surveys the flood damage from heavy rainfall in Squalo, an informal settlement near Cape Town. South Africa has an established, robust and transparent governance structure that includes well-defined national, provincial and municipal jurisdictions, with government entities at each level whose responsibilities are codified in law and regulation. This framework creates a solid foundation for municipal governance and service delivery to residents and commercial enterprises. However, South African municipalities face substantial challenges to maintaining and improving municipal governance as the country continues to address apartheid-era economic, spatial, political and social inequities while simultaneously facing the global rural-to-urban migration trend and its implications for basic service delivery and overall economic development. These challenges are compounded by increased climate change risks such as rising temperatures and increased frequency of extreme events such as droughts, floods and storm surges. Information for this assessment was collected from a desk study and field work. In the field, researchers met with national-level stakeholders, donors and research institutes, as well as with representatives from three municipalities: City of Tshwane, Buffalo City Metropolitan Municipality (BCMM), and Chris Hani District Municipality (CHDM). More information on the municipalities can be found in Annex A and a full interview list in Annex B of the full text. South Africa has taken several steps toward addressing climate change; this response has mostly been led at the national level, with some larger metropolitan municipalities (metros) also playing a major role. In 2011, South Africa developed the seminal National Climate Change Response White Paper and is currently working on a National Adaptation Strategy (NAS) – known internationally as a National Adaptation Plan (NAP). Many large metros and other large municipalities are integrating adaptation into their plans and practices. Smaller municipalities, on the other hand, are primarily dealing with day-to-day issues of providing basic services and do not have the capacity to get ahead of new challenges like CCA, which requires long-term planning. This is particularly challenging given that officials are elected to five-year terms. While national-level climate information is rather robust in South Africa, adding local detail to make that information actionable at the municipal level is a challenge, particularly for smaller municipalities with limited climate change expertise. The climate change function is often placed within a municipality’s environmental department, which can be a barrier to broader integration and acceptance of CCA within municipal planning and implementation. In the absence of a well-established institutional framework for CCA to date, municipalities demonstrating the greatest success in this area have been guided by local climate change champions who have established networks, garnered support from other municipalities and national government, and found creative financing mechanisms. Local climate change planning and policy documents are often developed by consultants, resulting in generic conclusions and recommendations that are difficult to put into action (and limit the ability of municipal staff to update plans and other management documents). Municipalities often lack the training, access to information, incentives or financing options to turn strategies or plans into action. Knowledge-sharing platforms and city-to-city mentoring can increase the flow of lessons learned and successful approaches among cities. South Africa’s metros are very active in global networks, such as C40 and ICLEI (Local Governments for Sustainability). Climate change is often seen as an “unfunded mandate” in South Africa; all levels of government are mandated through national policy to act on climate change, yet funding allocations thus far do not seem to reflect this imperative. A significant barrier to municipalities providing their own funding for CCA is the fact that many municipalities are already functioning at a revenue deficit and struggling to provide basic services. This leaves them little room for financing climate change actions unless those actions clearly satisfy basic services or other priorities. Several climate funds supported by international donors are active in South Africa, with multiple institutions accredited as National Implementing Entities (NIEs); however, many municipalities are unable to develop the detailed proposals required by these funds. Improve the availability and accessibility of climate information tailored to the specific and priority needs of municipalities, and assist municipalities to use climate information to undertake risk and vulnerability assessments that produce actionable strategy and planning documents. Of critical importance to work in this area is framing of climate information in ways that resonate with elected political leaders in municipalities, making those leaders into advocates for long-term adaptation planning and action. Support an integrated approach to CCA within municipality planning and budgeting processes. This could take the form of facilitating interdepartmental workshops to 1) educate all departments on climate change risks and impacts (sharing the results of a climate change vulnerability assessment (CCVA), for example) and 2) work toward buy-in from all departments to CCA objectives by demonstrating convincingly that climate risk presents a real and immediate threat to service delivery and that addressing it will improve the resilience of municipal services. This initiative would also assist in breaking down institutional silos that tend to exist around climate change, and by educating municipal personnel in the science of climate change and its practical implications would help create CCA champions within the municipality. Harness best practices and lessons learned to scale those experiences. The great majority of the CCA action at the municipal level thus far has been concentrated in the largest metros, notably eThekwini (Durban and surrounding area), Tshwane (Pretoria and surrounding area), Johannesburg and Cape Town. The financial and technical comparative advantage enjoyed by these municipalities must be actively used to disseminate good practices, adapting them 1) to the contexts in other municipalities and 2) to the resource challenges faced by other municipalities. Interventions should emerge from well-thought-out CCVA and climate change response strategies. Projects should have socioeconomic (ideally short-term) benefits beyond just responding to climate risks (to satisfy the incentive structure imposed by short-term election cycles and garner easy wins) as well as try to leverage local, national or international “targets of opportunity” (a local drought or a high-level event) to increase local buy-in and support. Support municipalities to identify and access finance that can be used for climate action. Entry points for assisting municipalities to access finance will differ depending on the municipality’s size, in-house technical capacity and financial readiness. In all cases, the long-term challenge of improving the evidence base of climate risk and vulnerability, and linking identified risks and vulnerabilities to budgeting (and ultimately, integration into the normal planning and budgeting process), must be a core objective to make adaptation sustainable. In addition, among larger, better-capacitated metros, assistance might take the form of supporting a bond issuance or developing proposals aimed at accessing international climate financing. Mid-size municipalities might not have enough capacity to put together a proposal for debt or grant funding from international sources but could aim for funding from the South African Green Fund or support from bilateral donors. Smaller municipalities have fewer options for accessing external funding, but with support from external stakeholders with greater capacity, they can build their own capacity incrementally. One possibility is twinning smaller municipalities with a metro located in their province to create a mentoring relationship that includes provision of technical expertise, taking the form of formal and informal training and occasional advisory services.